Mahendra Kumar Trivedi, Trivedi Global Inc. 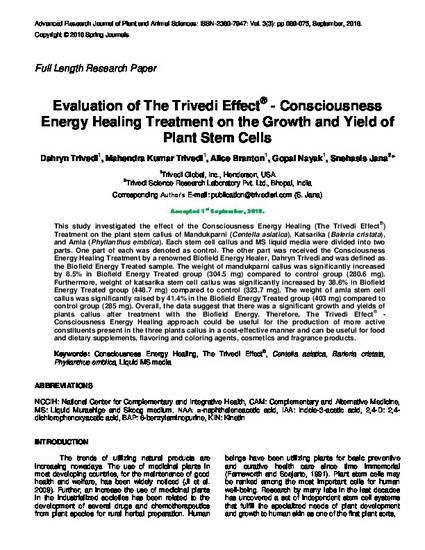 This study investigated the effect of the Consciousness Energy Healing (The Trivedi Effect®) Treatment on the plant stem callus of Mandukparni (Centella asiatica), Katsarika (Baleria cristata), and Amla (Phyllanthus emblica). Each stem cell callus and MS liquid media were divided into two parts. One part of each was denoted as control. The other part was received the Consciousness Energy Healing Treatment by a renowned Biofield Energy Healer, Dahryn Trivedi and was defined as the Biofield Energy Treated sample. The weight of mandukparni callus was significantly increased by 8.5% in Biofield Energy Treated group (304.5 mg) compared to control group (280.6 mg). Furthermore, weight of katsarika stem cell callus was significantly increased by 38.6% in Biofield Energy Treated group (448.7 mg) compared to control (323.7 mg). The weight of amla stem cell callus was significantly raised by 41.4% in the Biofield Energy Treated group (403 mg) compared to control group (285 mg). Overall, the data suggest that there was a significant growth and yields of plants callus after treatment with the Biofield Energy. Therefore, The Trivedi Effect® - Consciousness Energy Healing approach could be useful for the production of more active constituents present in the three plants callus in a cost-effective manner and can be useful for food and dietary supplements, flavoring and coloring agents, cosmetics and fragrance products.